Copyright � January 19, 2002, http://www.tnonline.com. 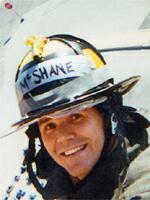 Every American was affected by the events of Sept. 11. TIMES NEWS readers responded immediately. The grass-roots Carbon County Area Relief Effort collected a truck-load of items for rescue workers at the World Trade Center and $7,000 in cash in less than three weeks. Many others came forward as well, from the Salvation Army and Windows of Hope collections in Tamaqua to a rock concert in Nesquehoning. And hundreds more stood in line for hours to donate blood. 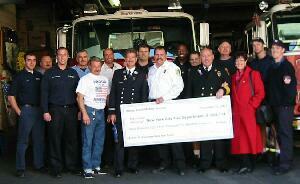 Volunteer fire companies collected money and pledged support. Some traveled to New York to work on the rescue and recovery mission while others visited FDNY companies to offer condolences and contributions. All these efforts have been greatly appreciated. Particularly moving to New York firefighters has been the response of children. From kindergarten on up they have sent cards, drawings, posters, and even quilts. Their heartfelt messages have touched the hearts of New York's bravest. Now we are asking you to respond again. FDNY Ladder Company 101, housed with Engine Company 202 in the Red Hook section of Brooklyn, lost seven men on Sept. 11 when Tower 2 came down. The men from E-202 waited for orders on the street as people jumping from the burning towers landed nearby. They barely escaped as the first tower collapsed. Knowing their brothers were inside, they worked frantically that day to save them, to save anyone. For the past four months the remaining firefighters from L-101 and those from E-202 have worked rotations at "the site," sifting through rubble for the remains of nearly 3,000 people. They have attended dozens of memorials and funerals for the 343 members of the FDNY. For some of their lost brothers, they have attended a memorial, and later, when a body has been recovered, newly healed wounds are opened as they attend a second funeral. They have taken a somber walk beside a flag-draped stretcher at least three times, and they pray for the awful, but welcome occasion to take that walk four more times. We can't help 11,000 New York firefighters. But we can do something for a bunch of guys who have been through Hell. What started out as an effort to get some free whitewater rafting passes for the firefighters of L-101 and E-202, has turned into another tremendous display of small town generosity. After hearing our request, Paul Fogal of Pocono Whitewater Rafting in Penn Forest Township offered enough passes for both companies. But wouldn't it be nice if they had a place to stay? The response ] overwhelming. The Resort at Split Rock in Lake Harmony donated several overnight stays, as well as a discount for additional visits during the year. Ten area inns have also donated a number of overnight accommodations. They include Riverdance Bed and Breakfast, Broadway House, The VictoriAnn Bed and Breakfast, Mary's Guest House, The Parsonage Bed and Breakfast, and The Oak Tree Inn, all in Jim Thorpe; Grassy Hill Bed and Breakfast, Palmerton; and Sweet Reflections Bed and Breakfast, Lehighton. In addition to accommodations, The Deer Meadow Inn, in Weatherly, has promised to secure complementary dinners in that area. When the Inn at Jim Thorpe learned 16 more rooms were needed to offer a visit to members and officers of both companies, it donated the rest. The next task is to secure gift certificates for area restaurants and visits to interesting sites or activities. Gift certificates or discounts from shops, museums and tourist attractions will also be appreciated. Noel Behan, owner of The Emerald Restaurant, J.T. 's All-American Steak and Ale House, and the Molly Maguire Pub, has offered eight dinners. The Big 2 Resorts of Jack Frost and Big Boulder have offered some lift tickets, and the Jim Thorpe Lions Club has offered up to 50 passes to tour the Asa Packer Mansion. It is our hope that each member of L-101 and E-202 will take the opportunity to visit the area sometime this year, either with their wives or just the guys. You can help give the men of L-101 and E- 202 a brief respite. Those who wish to donate gift certificates for meals or attractions, or who have questions about the project can contact Karen Cimms at the TIMES NEWS at (610) 377-2051, extension 3140; or toll-free at (800) 443-0377; or on-line at kcimms[AT]tnonline.com. While not necessary, additional accommodations would be appreciated to take some of the burden off those who donated multiple rooms. Financial contributions will help purchase what isn't donated. Businesses that donate accommodations or meals will receive first consideration when purchasing. Financial contributions can be sent to: The Red Hook Raiders Relief Fund, Citizens National Bank, P.O. Box 597, Lehighton, Pa. 18235. When we have done what we set out to do, any remaining money will be donated to the Richards Street Heroes Fund. In addition to or instead of a financial contribution, TIMES NEWS readers may send cards and letters of condolence or support directly to the firehouse at: Ladder 101 and Engine 202, 29 Richards Street, Brooklyn, N.Y. 11231. We especially encourage children, their parents or teachers, to create some special cards for these firefighters. 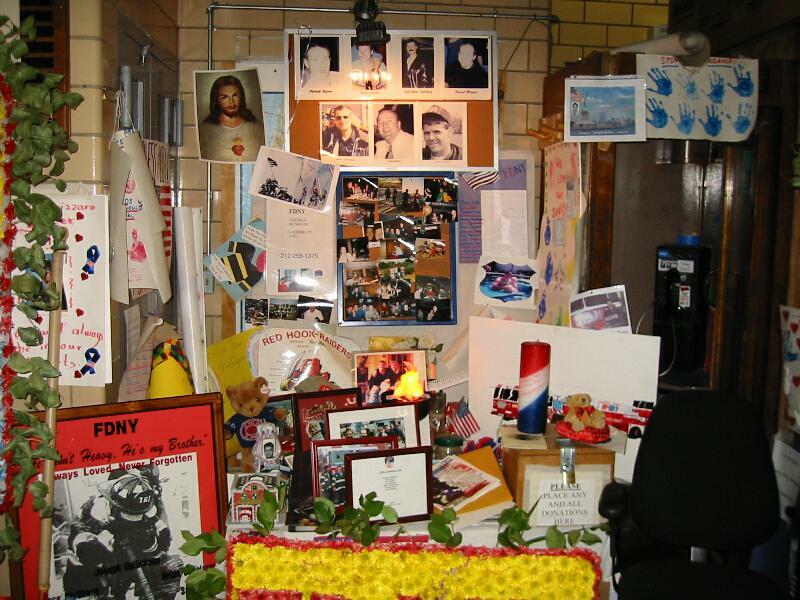 Donations for the families of the seven firemen who died on Sept. 11 can be sent directly to the "Richards Street Heroes Fund," at the same Brooklyn address. Open your heart, your wallet, or your box of crayons for the men of FDNY Ladder 101 and Engine 202. Let them know they are not forgotten. If past community response is any indication, we should be able to give these guys a much-needed break. As Charlie McHugh, Carbon County Director of Veterans Affairs said of the area's response to the Sept. 11 tragedy, "We may be small, but we're mighty."